The Ericsson GH337 was a superb phone and one truly worthy of the Ericsson name. Richard Lindahl of Malmo was responsible for the design of the basic shape, which was known within Ericsson as 'Jane'. Ericsson's first phone on this platform, as they called them, the EH237, won the coveted Caesar Award for 'Best Mobile Phone of the Year' in 1993. However, the EH237 was an analogue phone. Ericsson went one better with the GH337, a digital phone in the same, small body. When Ericsson announced the GH337 at CBIT in March 1994, it was the smallest and lightest digital on the market, pipping the well-established Nokia 2100. At its launch, the Ericsson GH337 was a top end business phone with state of the art features. The engineers at Ericsson went out of their way to make this the Rolls Royce of the mobile phone world. The earpiece was designed by Bang and Olufsen and the connection for the external aerial was gold plated. Ericsson also bagged the top award for this phone. It also won the Caesar Award for 'Best Mobile Phone of the Year', as well as getting the Design Award for a digital phone. In Germany, readers of 'Funkschau' magazine voted the GH337 "Product of the Year 1994" in its category. However, in spite of its numerous awards and strong recommendations by journalists and mobile phone dealers, the GH337's small screen was its downfall. As texting took off in the second half of the 90s, users found it irritating to scroll through long messages. The Nokia 2110 was a better pointer to the future. Ericsson launched the PH337 in 1995, designed for the One2One PCN network. At the time it was the smallest PCN phone on the market. It was One2One's flagship phone in 1997, retailing at £100. The PH337 boasted 120 minutes of talk time from a single battery charge. Ericsson continued to improve the GH337. 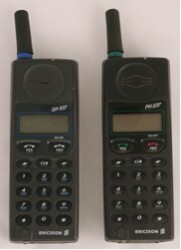 In 1996 the GH388 came along which was 3mm slimmer and had an improved battery life. The PCN equivalent was the PH388. I've been searching for a GH337/388 for years now! I never found a cheap one without Sim-Lock. Is your GH388 Sim-Lock-free?